being little • bristol uk fashion & lifestyle blog. : beautiful bird. You might remember this illustration that I did for my big brother's birthday. He asked me to draw a bird that he could get tattooed to represent his daughter, because the name Evelyn means "beautiful bird". 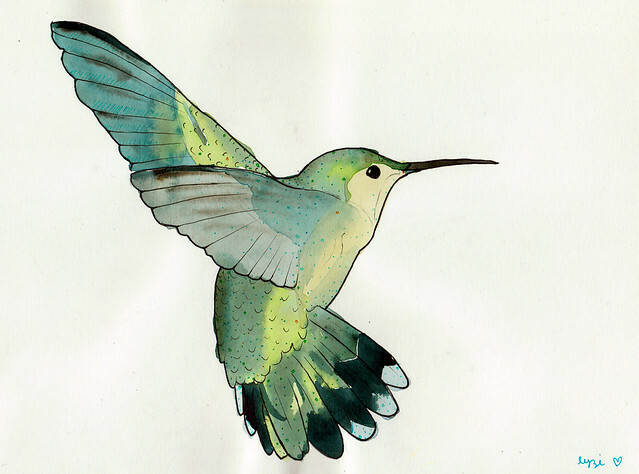 We decided on a hummingbird because they're tiny like her, and they're so colourful. Well, a couple of days ago, he got it done! Scott did an amazing job, the colours are beautiful and it looks great in that position. I want it done now, too! That looks amazing! Well done you for doing such a beautiful illustration. I love that illustration, it's gorgeous! WOW, but boy did that look like it hurt something rotten. Wow! I designed a little illustration once that a friend has tattooed... it feels pretty special to know that someone out there has a bit of your handiwork on their body forever! Tattoos are ever better when they have a special meaning. That is such a stunning illustration. I bet he is chuffed to bits with that tattoo, it looks really awesome! 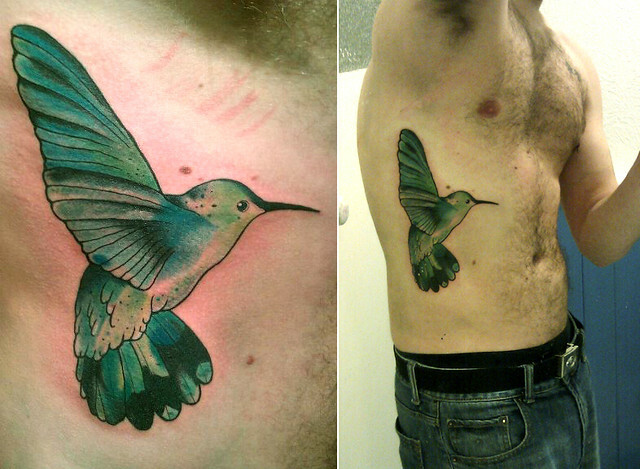 What a beautiful illustration, and a beautiful tattoo! Especially given the sweet meaning behind it. Absolutely gorgeous! I SO almost got a hummingbird tattoo but got a russian doll instead.... Cuz you know, they're so alike. Starting to think I should have gone for the bird now! It turned out so well and the fact that you created the design is so special. The colours are wonderful. You did such an amazing job! It looks stunning! What an amazing idea. So special and personal. Wow that looks so awesome! The colors are amazing!